+ on the basis of the Central Vigilance Commission’s (CVC) report raising serious questions on Verma’s integrity. “The panel took into account the extremely serious nature of observations made by the CVC against Alok Verma. The panel was of the view, that being the head of a very sensitive organisation, Verma was not functioning with the integrity expected of him,” a source said. Kharge submitted a dissenting note. 1. In the Indian railway catering and tourism corporation case involving former railway minister Lalu Prasad, the CVC felt that it can be reasonably concluded that Verma deliberately excluded a name from the FIR, for reasons best known to him, said sources. + for his role in the Sterling Biotech case, besides finding him guilty of seeking to induct officers of doubtful integrity in CBI. 3. Verma while functioning as Delhi Police chief in 2016, allegedly instructed escorting of a gold smuggler who was caught by customs. The CVC found allegations partially substantiated and recommended investigation by a different branch of CBI. 4. 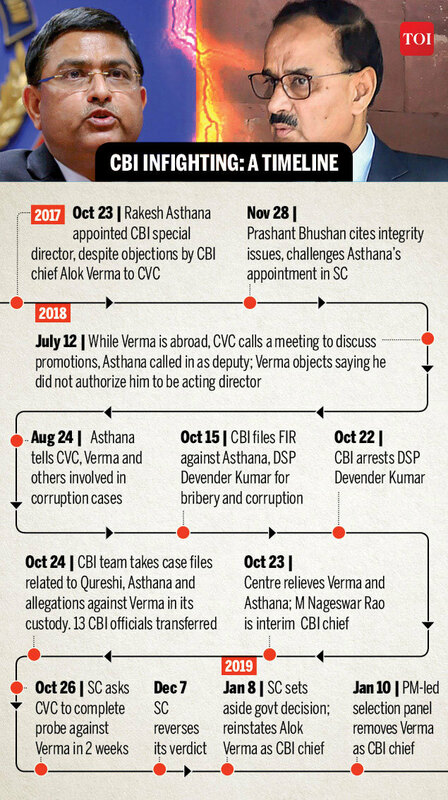 In a Haryana Land Scam, Verma is accused of being in touch with then director of town and country planning of Haryana in which Rs 36 crore allegedly exchanged hands to make sure that the preliminary enquiry was closed. CVC said that further enquiry was required. 5. Verma allegedly made attempts to induct two tainted officers in the agency, despite adverse reports against both. CVC found the allegations substantiated.